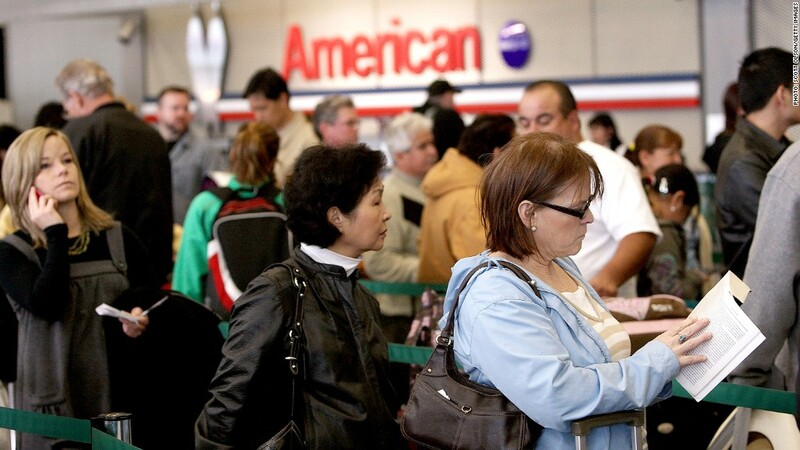 Passengers wait in line to check in for American Airlines flights at Chicago's O'Hare Airport. In a surprise move, the Department of Justice filed a lawsuit Tuesday challenging the $11 billion merger of American Airlines and US Airways, claiming the deal would drive up costs for travelers. But some recent reports on consolidation in the industry offer a more mixed picture. "There are definitely some markets that are winners and some markets that are losers after a merger," said Jonathan Kletzel, US Tranportation & Logistics Leader at PricewaterhouseCoopers. "We're not saying that there aren't places where mergers impact prices, but when you look in the aggregate, it's not a doomsday scenario where prices are going to shoot up." Assistant Attorney General Bill Baer said Tuesday that the merger would cost consumers "hundreds of millions of dollars." "We simply cannot approve a merger that would result in U.S. consumers paying higher fees, higher fares, and receiving less service," Baer said. The proposed merger, announced in February, comes following years of unchecked consolidation in the industry. It would leave just four major airlines competing for customers in the United States, down from 10 in 2001. Those four -- Delta (DAL), Southwest, United Continental (UAL)and the proposed American-US Airways combination -- accounted for 83% of U.S. airline passengers last year. The Justice Department says the new merger "would create strong incentives" for American and US Airways "to reduce capacity and raise fares where they previously competed." The Government Accountability Office said in June that the merger would result in many more routes losing a competitor compared with the 2010 merger of United and Continental, which created what is currently the world's largest airline. But the "great majority" of these routes would still retain multiple competitors, the GAO said. The European Union signed off on the American-US Airways merger earlier this month under the condition that the new airline give up slots to allow new competition on the Philadelphia-to-London route. Previous mergers over the past decade have led to the combination of Delta and Northwest, United and Continental, Southwest and Airtran and American West and US Airways. But despite the reduction in major carriers, fare increases over that period have been modest, according to PricewaterhouseCoopers. In a study released in December, the firm found that average domestic airfares increased by just 1.8% annually between 2004 and 2011, slower than wage and fuel costs. On an inflation-adjusted basis, fares actually decreased by nearly 1% a year during that stretch, and have ticked up only slightly in the past few years, PwC says. Kletzel said the mergers of major carriers tend to benefit low-cost competitors, who can move in where there are overlapping routes. US Airways, for its part, appears to view mergers in the industry as an opportunity to raise fares. The DOJ complaint quotes the company's CEO as saying in 2011 that fewer airlines is "a good thing." The company's president said that year that US Airways had been able to raise fares on several occasions "because of consolidation," according to the complaint. The Justice Department adds that US Airways' "aggressive" discounting strategy, in which customers can save up to 40% if they take a connecting flight on US Airways as opposed to a non-stop route of a competitor, would be lost following the proposed merger. Fees taking off: Beyond route competition, the Justice Department is concerned that the merger would raise fees for things like baggage, flight changes and the redemption of frequent flier miles. US Airways generally charges higher fees than American. Citing a US Airways analysis, the Justice Department says fee "harmonization" following the merger would cost consumers $280 million annually. Ancillary travel fees have already risen substantially in recent years, adding 9% to basic airfare costs in the first six months of 2012, according to PwC. The firm says the increased fees "are not necessarily merger- or consolidation-driven," and "have been adopted by the industry overall and not only by certain carriers on certain routes." The proposed merger, though, could accelerate this trend. The DOJ complaint quotes the president of US Airways as saying in 2012 that consolidation has "allowed the industry to do things like ancillary revenues." "That is a structural permanent change to the industry and one that's impossible to overstate the benefit from it," the executive allegedly said. American and US Airways (LCC) said in a joint statement Tuesday that a blocking of their merger would "deny customers access to a broader airline network that gives them more choices." "Integrating the complementary networks of American and US Airways to benefit passengers is the motivation for bringing these airlines together," the companies said. American declined to comment on whether the deal would increase costs for travelers; US Airways did not respond to requests for follow-up comment. CNN's Evan Perez contributed reporting.